The mysterious and beautiful village of Liberalis lies just northwest of the shrine of compassion and south of the dungeon Wrong (89o 44’N, 30o 56’E). Its mayor, CopperZerO, can be found with a cheerful grin for most anyone who pays a visit. Rich or poor, good or evil it doesn’t matter for in Latin, Liberalis means Freedom. They are dedicated to the education of all young people. 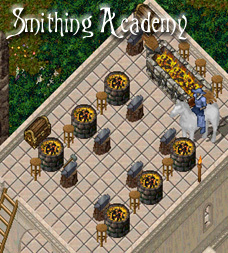 With their training centers in most of the arts you can find grandmasters like, Blake Jr., on hand at their Smithing Academy or adept weavers at their Tailoring School. Plus for all you mages on the make, the Institute of Magery is a fine place to practice your craft. 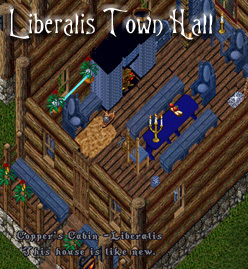 Liberalis itself is famous for the ring of water barrels that has been home to many events like our early fierce dragon slaying competitions. Also, the Ya’ll Come Back Saloon hosts a Ball and Barbecue every Thursday night at 7PM Pacific time. Feel free to stop by anytime and partake of shopping, tours, events, hunting, our just sit back and enjoy the area as the clouds loft by. The surrounding woods harbor many natural dangers so staying near the central area of the city is advised unless you’re looking for a good fight.